It’s Christmas Eve! And whether you celebrate today or tomorrow, somewhere in the holiday merriment you are going to want a festive breakfast that gives you some delicious strength for the unwrapping and oohing and aahing and possible a trip or two to the mall to exchange things. And for all that, I highly recommend this breakfast risotto chock-full of creamy rice with bacon, egg and artichoke hearts. Just the right amount of easy mixed with fancy mixed with scrumptious. One thing I have learned over the years with risotto is that you do NOT, and I mean do NOT, have to stand there at the stove stirring it continuously for 30 minutes or until your arm falls off, whichever comes first. Give it a nice stir every time you add a little more broth and I promise you and your risotto will be just fine. In the case of this risotto, this gives you a chance to cook up the bacon while the rice is cooking. Save the egg for the very end – you want it to be soft-cooked with a nice creamy yolk so that it can melt right into the risotto when everything is ready. As for the artichoke hearts, the frozen packaged kind are just fine for this – thaw them out a few hours before you are ready to start. All of this wonderfulness is going to come together into a beautiful combination of flavors that is going to make you feel merry and bright no matter what time of year you make it. Risotto for breakfast! Now start adding the broth in 1/2 cup increments, letting the rice absorb each half cup of broth before you add the next one. Stir from time to time. All the broth should be added and absorbed in about 25 minutes. While the risotto is cooking, poach the eggs by bringing a large deep skillet of water to a simmer. Crack each egg into a small bowl or teacup, then gently slip each one into the water. Cover the skillet, turn off the heat and let the eggs sit in the water for exactly four minutes. Then scoop them out with a slotted spoon and put them on a plate. 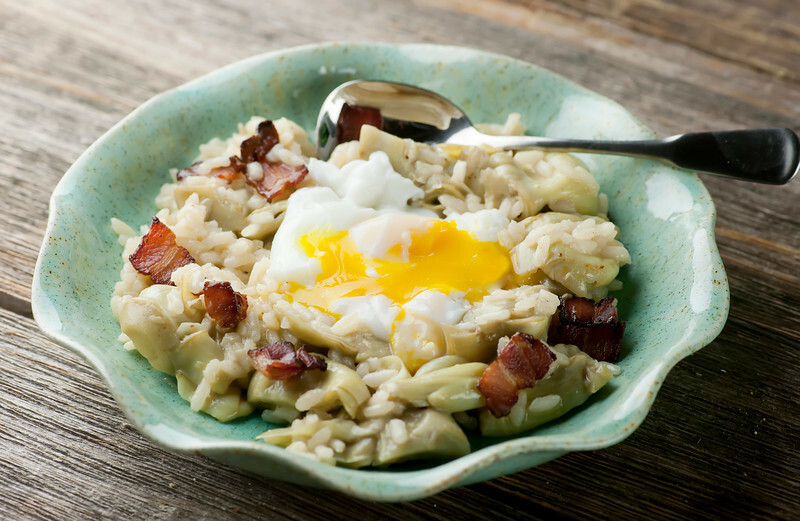 Back to the risotto: when the rice is cooked, stir in the butter, bacon and artichoke hearts. Taste and add salt and pepper as needed. Divide the risotto among 6 bowls and top with a poached egg. Break the egg so the yolk spreads into the risotto. Serve at once. Feel merry. I definitely wish I had had this for breakfast now!